Previously we have created our master / parent disk. 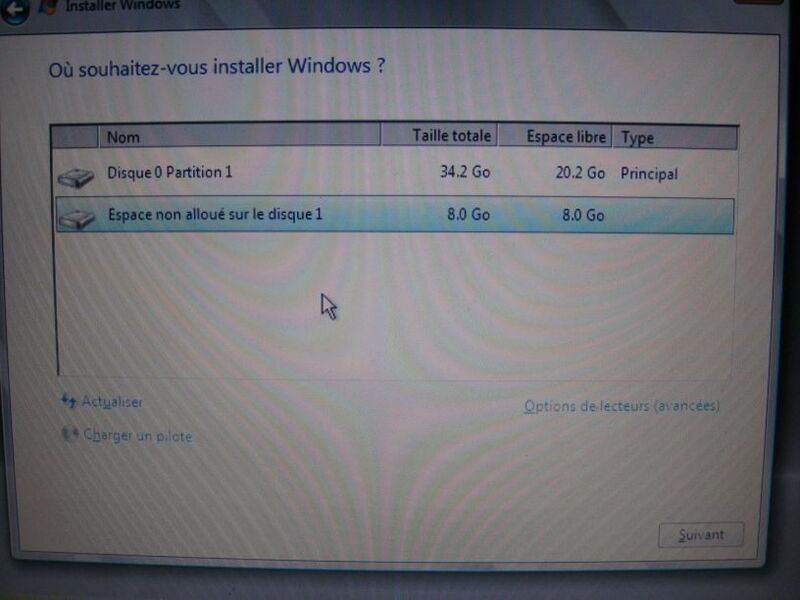 Lets now create our differencing / child disks using our host (windows 8.1) virtual disk capabilities. Lets do it in one batch. Notice how the second virtual disk now has a different signature (since we forced it online…). 3.Install new OS, or transfer existing OS, to a volume that will be shared over iscsi. Here below I use Tiny Pxe Server. we set keep-san=1 (in case we want to install directly to san) and dhcp priority=1 to over rule any dhcp server on your lan. Note : as an option, you can skip the dhcp/tftp server by using a boot disk (floppy or cdrom) made by gpxe. Use the generated boot disk on your physical computer or in your virtual image. –iscsi cake can mount any thing like vhd, vmdk, disk, etc. –rocket division startwind can mount image files,disks, etc. –openfiler / freenas can also act as iscsi target but can « only » create disks, not mount them. The iscsi target can be used either during the installation or for the transfer of an existing windows installation to an iscsi volume. Here below a screenshot of one xp disk mounted in Starwind (free for one connection). 3.Install new OS, or transfer existing OS, to an image that will be shared over iscsi. 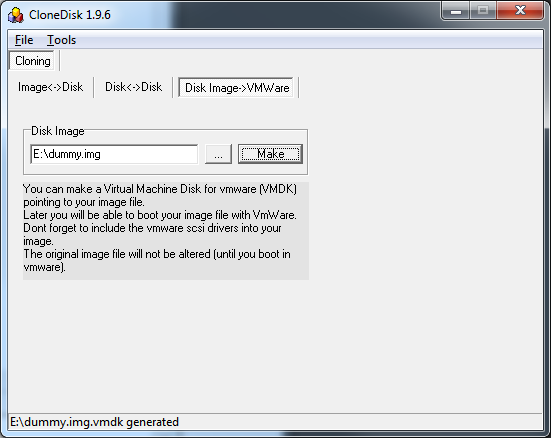 -(2) have a vmdk point to a blank img file (monolithic vmdk option) and install thru vmware. See below how to. Here below vmware settings to install xp on a physical device (choice 2 above). Note that \\.\physicaldrive1 is actually a vmdk pointing to my disk image file (which we will use later in starwind). See lower in that page on how to make that vmdk. -(3) install to a local physical disk and clone it to an img file afterwards. See below how to. 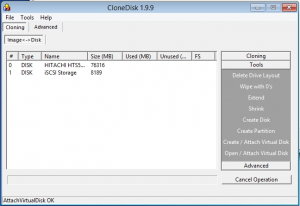 If you have an existing windows, transfer it to an image file using a one to one disk cloning software. Backup the physical drive, not the logical drive / partition. 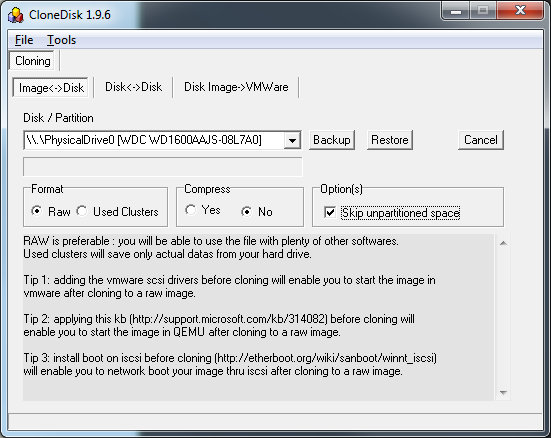 Note1 : CloneDisk can create a vmdk file for you, pointing to the image file of your disk. 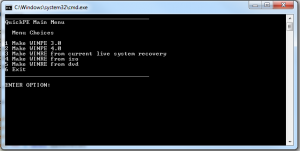 You may even be able to boot on your image file from within vmware server. If so, dont forget to install the scsi vmware driver before cloning and to restart in safe mode on the target vm guest. Note2 : QEMU can also use the raw image file. 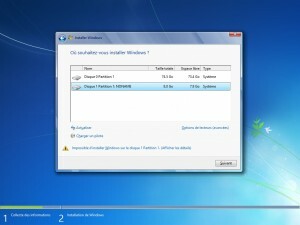 Then apply this http://support.microsoft.com/kb/314082 before launching in QEMU to avoid a 0x7b BSOD. Not needed for W2k8, Vista and Windows7 as they support natively iscsi boot. Note : you have to set the msiscsi service to start=auto (and possibly to add the target to the iscsi initiator?). If not done yet, setup your iscsi target (see step 2) with a prepared image file. Unless you have an hba with iscsi support or network card with gpxe built in, setup your pxe server (step 1). Lets test it in vmware. see below the disk seen from Windows , once booted over iscsi. Constraint : network card needs to be the same before/after in order to boot. You can add another network card before migrating to another computer, see here http://etherboot.org/wiki/appnotes/port_winnt_sanboot . -flash your network card with gPXE, turning it into a boot on san device. In that case you dont need a pxe server anymore, config (target and rootpath) is saved directly in the network card. 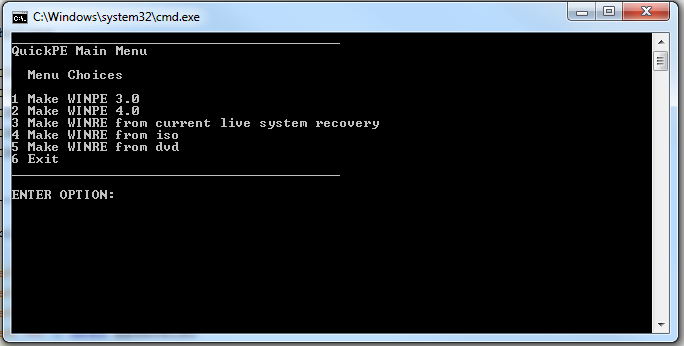 -flash your motherboard network rom with gPXE. 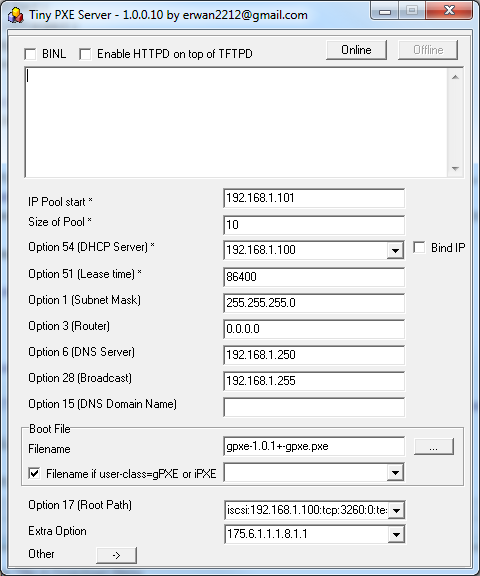 -Use a gpxe nic rom in vmware to skip the dhcp/tftp part (nbios.filename vmx parameter). Configure bios in that order : network,cdrom,disk (or floppy, cdrom, disk if you go for the floppy bootstrap loader option). -With vmware virtual server, you need to load your vmxnet driver in order to see your iscsi target. -It is recommended to load also you vm scsi drivers. Setup a dhcp/pxe server with gpxe bootstrap loader and keep-san vendor option and root path set to iscsi. ->root path in my case was iscsi:192.168.1.100:tcp:3260:0:test. ->vendor option is 175.6.1.1.1.8.1.1 (etherboot length 6 code 1 length 1 value 1 code 8 length 1 value 1). ->Here I use Tiny PXE Server under windows which supports the specific vendor and root-path options. See discussion about this tool here. As an option, you can skip the dhcp/tftp server by using a boot disk (floppy or cdrom) made by gpxe. To make it easy on you, here are the image : floppy usb iso. Setup an iscsi target with a blank image file (filled with zero). 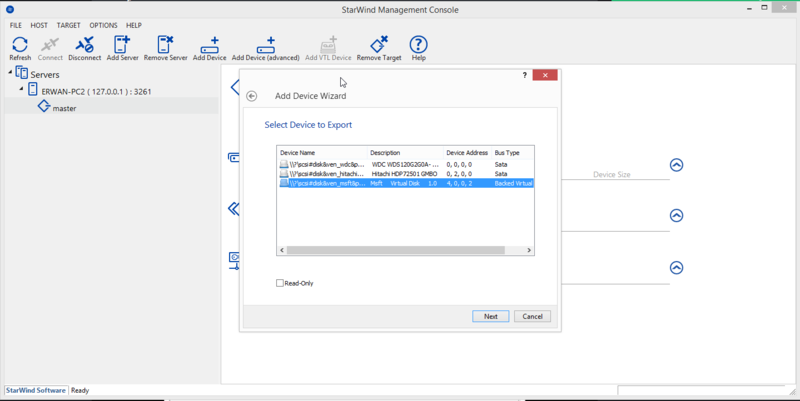 ->I use StarWind from RocketDivision. Windows 2008 setup should now see the iscsi target as a local disk (since we use the keep-san gPXE option). If not, shift+f10 to go and command prompt and check your network with ipconfig /all . Next reboot will the computer boot directly on the iscsi target.